With the “European Stork Villages” initiative EuroNatur has set up a movement to help counterbalance the habitat loss for storks in Europe. Since 1994 the EuroNatur foundation has honoured the contribution of 15 villages in 15 European countries for their engagement in white stork and nature conservation with the title “European Stork Village”. 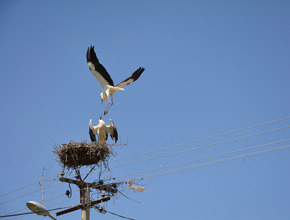 Candidates for the title are villages or parishes with resident stork colonies. 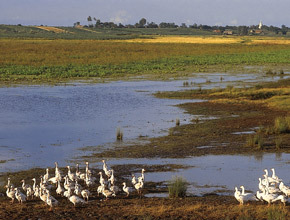 The local people have put much time and energy into the protection of storks, for example by adopting extensive farming practices and of conserving large areas of wetland. With the title, the communities are internationally recognized as special cultural and natural heritage sites. In this way we are working to encourage successful approaches to the protection of nature in general and white storks in particular. In the Croatian Lonjsko Polje Nature Park home of the first European Stork Village, Čigoč, a lesson comes alive. A lesson on how people can utilize wet meadows and pastures and at the same time share the natural wealth of these habitats with a bounty of wild species. In spring the area teems with wildlife. Storks, herons and spoonbills feast on the abundance of frogs, snakes and insects. White-tailed eagles soar through the sky and in the evenings the air is filled with the croaking of the European tree frog and the characteristic moaning of the fire-bellied toad. For many generations people in Čigoč have been using the floodplains of the river Save to raise their cattle, horses and pigs and at the same time as a natural flood prevention system. The regular flooding provides nutrients and moisture to the meadows, pastures and woodlands. It nourishes the farm animals and a diverse fauna and flora. Nowadays local people benefit from their traditional pasturing system in yet another way: The beauty of the landscape and the biodiversity attract bird watchers and nature lovers from all over Europe and are thus supporting small ecotourism enterprises and the Nature Park Lonjsko Polje. EuroNatur is a charitable foundation which is based in Radolfzell, Germany. In our project activities we focus like no other organisation on creating nature conservation across national borders. As an internationally active nature conservation foundation we have made it our task to conserve our European natural heritage in all its diversity and to protect precious natural and ecologically valuable traditionally cultivated landscapes in Europe. CICONIA is a charitable foundation and was founded in 1997 in Schaan (Principality of Liechtenstein). The aim is to support nature conservation and environmental education projects along the international migration route of White and Black Storks. Comprehensive habitat improvements and protection are realized. In Addition, environmental education projects contribute to long-term sustainability in nature and environmental protection.